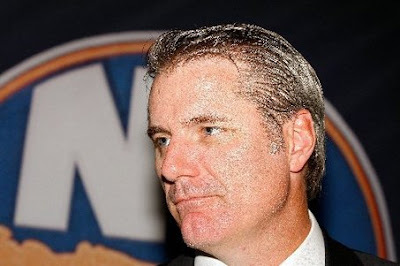 Hockey Plumber: The New York Islanders: Poised To Make a Move? The New York Islanders: Poised To Make a Move? In a dimly lit corner of his serenely quiet office, Garth Snow coolly flips to the B-side of an unlabeled vinyl 78. The needle stirs with a slight pop, as the turntable begins to spin, a dulcet voice-over with Latin music undertones invites Snow to begin tapping his foot to the beat. "They once won the Stanley Cup... Four times in a row." "The team plays in a barn... under the banners of Bossy, Trottier and Potvin." "A rival GM once remarked: 'I wish I had the Islanders' cap space.' "
"They are... the most interesting team in the NHL." With approximately a bazillion dollars available under the salary cap, and supposedly no financial restrictions imposed by ownership, many have noticed that the Islanders are in a prime position to do something significant to bolster their lineup. The UFA pool is all but dried up. Yet, there are a number of teams, who for one reason or another, would like to clear a bit of space. The Isles would be an ideal trading partner for any team wanting to get something back for their impending free agents. They have the cap room, and prospect assets to get nearly any deal done. The Islanders could be looking for anyone who can score: forwards, or defensemen to take pressure off of Mark Streit. They could use some bottom six character forwards, or crease clearing bangers on the blueline. So lets take a look at some scenarios. With a slew of roster changes, Washington is currently over the cap max. They will have to do something. Trading Alex Semin, Mike Knuble or Mike Green in a contract year might be a risk, considering their personal motivations, but moving an asset now would give the team the most time to make adjustments. 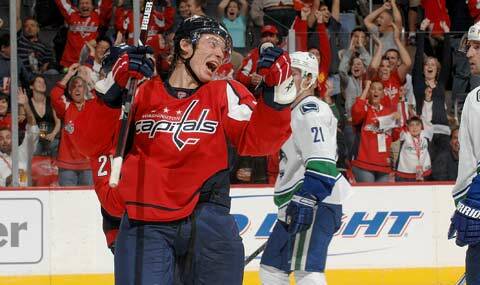 Semin has been talked about for years. He would clear the most room for the Caps and provide the Isles with a true sniper. Green would have been unthinkable a few years ago, but due to fluke injuries, the Caps have thrived playing without him. He would be a long-term hockey investment in Long Island and give the team a deadly powerplay pairing with Streit. Knuble is a possibility here too, as he be lower risk for Washington, and provide the Isles with net presence, and move into a role similar to what they had in Doug Weight, only more productive on the ice. The Jets have shown no loyalty to the old regime from Atlanta. Surely that applies to the roster that was inherited as well. While now in a healthy ownership situation, it doesn't mean that Winnipeg would shy away from shedding some bigger contracts to allow greater flexibility to shape the new Jets roster in a manner that suits the new coach's system. Nik Antropov or Ron Hainsey are two players with a combined cap hit of $8.5 million. 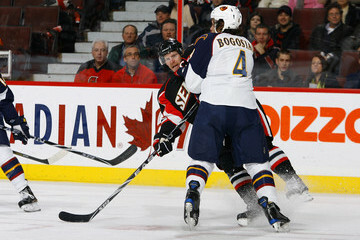 Additionally Zach Bogosian remains unsigned as a RFA. Opinions vary on Bogosian's development thus far, and therefore there is some question on what is his true market value. All three skaters represent an upgrade for the Isles, while only Bogosian would command a significant return in order to obtain. Although a trade within the division is less likely, the Flyers may consider moving Matt Carle or Braydon Coburn while in the last year of their current deals. Dustin Penner could be moved from Los Angeles to ease the cost of a new investment in Drew Doughty. The re-signing of Eric Brewer could precipitate the exodus of Pavel Kubina from Tampa. 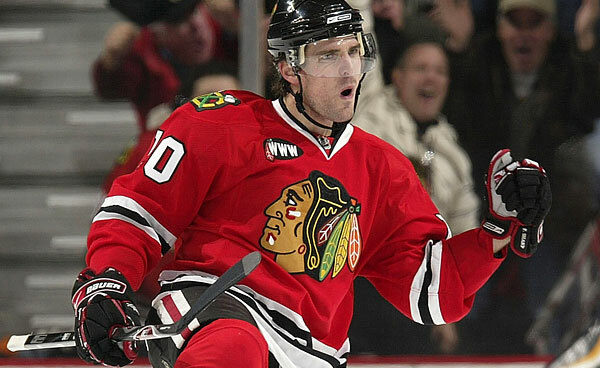 Even Patrick Sharp could be put in play as the cap will tighten up again for Chicago next season. Carle, Coburn, Penner, Kubina and Sharp all offer an element of toughness and skill that could push the Isles forward. Again, the team possesses the cap room and core to make a leap as soon as this season. If past performance is any indication, Garth Snow will likely make the right decision, regardless of the move or lack of one. At least they aren't in a financial problem but they are doing well and they should hire more high quality players. It would make things interesting for Host PPH fans. I am often asked what a Plumber has to do with Hockey. For those who are still curious, a "plumber", in hockey lingo, refers to a player with a blue collar style. A plumber is not afraid to do the dirty work. Interchangeable terms would include: mucker, grinder and pipe-fitter. Hope it helps and keep coming back!